When it’s grey and cold at home, there is nothing quite like a sunny spa getaway. And as I sink into the cocoon of cloud-soft towels for my first 60-minute relax and renew massage at Daios Cove’s Anne Semonin Spa, the stresses and chills of home feel light years away. I’ve travelled to Daios Cove for a rejuvenating few days in the sun. 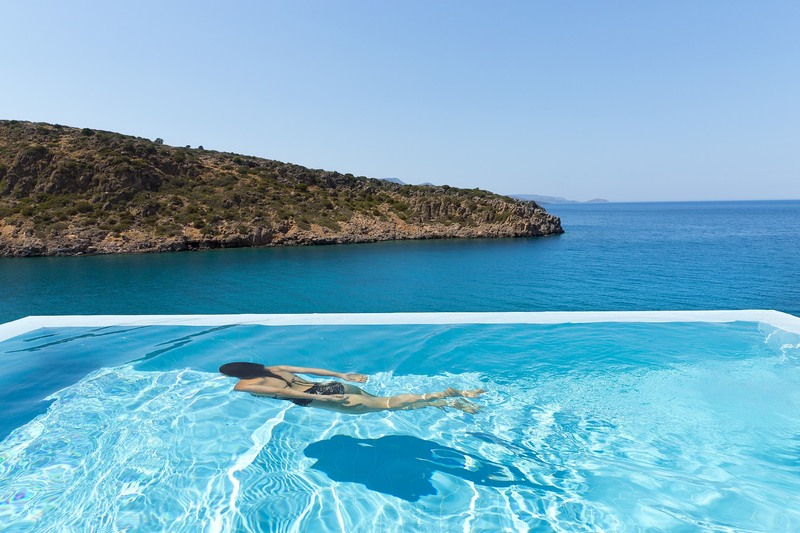 It’s an easy 50-minute transfer from Heraklion airport to the stunning five-star resort on the north-eastern coast of Crete and as we wind along the mountainous roads, the breathtaking glimpses of the glittering Aegean Sea are already soothing my soul. The sumptuous resort trickles down a picturesque maquis and bougainvillea-dappled hillside towards a private azure bay. The 35-hectare site nestles into the undulating landscape and with 35 capacious villas, 251 luxury rooms and suites, 165 of those with private sea water pools, it’s easy to see why guests find the peaceful, luxury residences a real sanctuary. When they aren’t enjoying their plunge pools, the main sweeping infinity pool or private crescent of sandy beach, the 2,500sqm Anne Semonin wellness Spa is a destination in its own right. Thanks to floor to ceiling glazing running along the entire front of the building, the spa’s indoor pool is blessed with glorious sea views. Even the fitness suite has a 180-degree vista, so if those views don’t motivate you to pick up the weights, nothing will! A crystal waterfall chandelier drops from an azure blue domed ceiling in the spa’s atrium reception, an indication of the luxury that lies behind. And if the atrium, thermal pools and studio are all about bringing the Greek landscape and cloudless sky in, the interior of the spa, its treatment rooms and relaxation areas are focused on creating private, calm and cosy spaces hidden away from the world. The interior is a labyrinth of low-level light relaxation loungers, warm tones, woods and post-treatment cuddies that feel reminiscent of Thailand spas. Treatment rooms (there are five single rooms, two private spa suites and a specially designed Thai massage suite) are a serene blend of tranquil colours and textures and cater for the wide range of treatments on offer, from de-stressing and Cryo freeze facials to body-contouring masks, proprietary exfoliations and detox wraps. The spa uses Anne Semonin products, the French spa specialist and one of the pioneers of made-to-measure skincare; the essential oil blend used in my massage is heavenly. Two private spa suites boast a sauna, steam room, relaxation area, bath, shower, Raxul and treatment area for two guests. The wet spa area has a Finnish sauna, soft sauna, Mediteranneo (a combination of sauna and steam bath), Nimfea reaction showers where different water pressures (rain, storm and massage) rejuvenate and invigorate and an ice fountain. The Wellness Spa Suite can accommodate up to four people (60min 140 €) and is great for couples or friends wanting to enjoy some quality time together. The private sauna, steam bath and a hydro massage bathtub for 2 with massage jets come as standard and guests can also order self-applied mud body masks. The heated hydro-jets pool is great for soothing aches and pains and getting the circulation pumping. The spa also launched wellness and detox programmes in 2017 and will continue to evolve these in 2018. One recent addition is the four- and seven-day IMMOT Detox Programme (Intelligent Metabolic Mediterranean homeostasis Therapy) to promote weight loss, fat burning, increased immunity, developed by wellness experience experts Eucrasia. The programmes begin with hormonal, biochemical, blood and cytosine of adipose tissue check-ups and complete cellular stress scanning, and the personalised programmes developed on the back of these results include a nutritional Mediterranean diet plan designed to reduce inflammation and boost gut flora; spa and relaxation treatments including detoxing massages and wraps; full body workouts designed to continue at home; personal training fitness sessions each day and targeted body workouts. After the IMMOT Detox Programme has ended, guests are given access to a personalised online portal for two months where they can access further expert consultations and view their programme and test results. If a private pool suite isn’t quite capacious enough, or you’re travelling with multiple lucky guests, The Mansion is certainly a class of accommodation above the rest. The new exclusive villa boasts an outdoor heated pool, indoor heated pool, staff quarters and its own spa. Set over three floors, plus 300sqm of outdoor living space, the three-bedroom sumptuous residence offers unrivalled privacy, luxury and space. Guests still have access to the resort’s amenities and facilities but occupy one of the best positions on the hillside and the Mansion’s fully equipped spa has a Starpool steam bath, 20sqm heated indoor pool, large sauna and treatment arena. 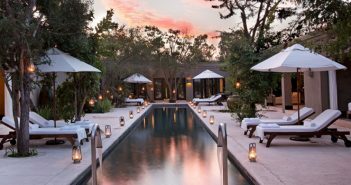 Therapists are on hand for private facials and spa sessions in the massage area, or on the privacy of the Mansion’s sun-drenched pool deck. For those looking to work out, the villa has its own gym packed with the latest equipment from Technogym and guests can book personal training sessions as well as yoga and Pilates. With private chefs, spa therapists and staff, this uber-stylish and stunning villa will no doubt provide a haven for those guests looking for the ultimate getaway. Quality time is sacred. And Daios Cove understands this; here is a boutique resort where you truly feel your enjoyment and relaxation is of paramount importance. The location and suites are beautiful, the in-house restaurants excellent and the level of service first rate. Accommodation, from entry-level rooms to suites, is stylish, roomy, well appointed ­and peppered with luxury touches and with other guests enjoying their private plunge pools, the main pool, beach and grounds never feel crowded (during our stay the resort was at 85% occupancy, yet it felt more like 50). I fell in love with Crete years ago thanks to its balmy year round weather, stunning coastline and fantastic food, but Daios Cove adds another string to its bow. A comprehensive spa offering and luxury getaway in one of the prettiest parts of the island. Nightly rates for the 2018 season at Daios Cove start from £214 per room, per night on a half board basis, a saving of over 30%. Visit www.daioscove.com or call 020 3807 1418.